Once I was picking sour cherries with an erstwhile boyfriend. The arrangement -- 2 quarts for the farmer, 1 quart for me -- meant that I had to pick pretty quickly, and I was greedily picking away (plink-plink-plonk), juice running to my elbows (plonk-plank-plink), gnats sticking in the juice (plunk plunk plink), when the boy announced (plink) that he didn't, in fact, like picking cherries (plonk). Unfortunately, I said something that may have included unfavorable references to his D&D character's Constitution, and things fizzled out shortly thereafter. This summer, Mama calls me up to tell me how many sour cherry quarts -- nay, bushels -- she's put up, while I hunt and peck to find them in San Francisco at $5 a pound. Sure, I can tolerate the widely-available sweet Bing and Rainier cherries, nibbled juicily fresh off the stem, but they turn to a mealy bland mush when baked. Pie cherries, though, positively ripen under heat, getting glossy, translucent, and breathtakingly intense. Withstanding the oven's crucible -- now that's a winning trait. And cherry pie is my favorite flavor of heaven. But what's to be done when a pie's worth of sour cherries cost more than $10? Stretch them out over pastry cream and a rich shortbread crust. When the crust and pastry cream are cool, spoon the pastry cream in the tart shell. Rinse and pit 2 cups sour cherries. Pitting is most easily done with a paperclip. In a small saucepan, whisk together 4 T. sugar and 1 T. cornstarch. Drizzle in 4 T. red wine, blend well, and add the cherries. Bring to a simmer over medium heat, stirring constantly until everything thickens, turns clear, and boils. Remove from heat and stir in a splash of bourbon. Immediately spoon on top of pastry cream. Chill till set. Avoid transporting on public transit during rush hour. Serve with soft dollops of lightly-sweetened whipped cream. And, my dear Paprika Head, we got some more sour cherries from the pre-Dylan concert tree this year! I made a deal with the birds: they could have the top half, and I would get the bottom half. They seemed to stick to the bargain (if indeed they ever agreed to it). 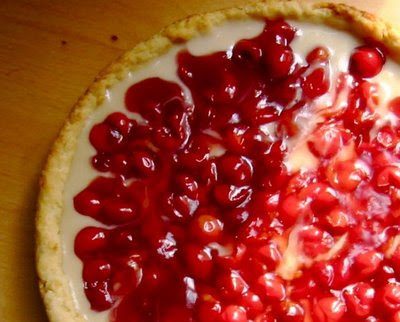 I'm forwarding this cherry cream tart recipe on to Jude, hoping she will not be able to resist making it. I thought of you all the while I picked, and then pitted with the paper clip. Dylan was NOT a mess. The man's sixty-five! Give him a break! Geesh. Auntie Sylvie, do let me know how it comes out if Aunt Jude makes it. So glad that tree's living up to my glorious memories.... I'm so thirsty for a warm Lancaster evening like that one! And by my calculations, Mr. Wilsony Wilson, Dylan is now 67 -- as his birthday is the same as Mama's, though he is a good deal older, for sure. Anyway, he's the wiry sort of 67 that requires no breaks or soft punches. This is very, very pedantic, but sweet cherries in Hungarian are cseresznye, not cseresnye.